A lot of wearers notice that the LeBron Soldier 10 feels very supportive. Much like the Air Jordan 12 Retro, many are reporting that the Soldier 10’s high-cut design provides great ankle support. Most users assert that these LeBron basketball shoes are very comfortable and feel great when moving around the court. Several buyers just love the shoe’s laceless design. They find it unique and stylish. The Nike Zoom LeBron Soldier 10 is perfect for bigger and more explosive players, a good number of reviewers observe. Almost all testers are pleased with the shoe’s upper. They’re saying that the materials feel very soft and do not require any break-in time. Some purchasers comment that the shoe has traction that grips the floor well. 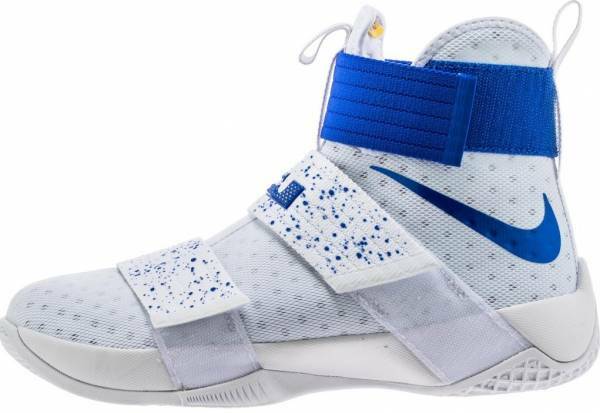 The Nike LeBron Soldier 10 is surprisingly light and is well ventilated, a number of wearers remark. A good number of users are satisfied with the shoe’s overall performance. The Nike Zoom LeBron Soldier 10 is very difficult to put on, a good number of wearers complain. The shoe’s opening is just too small for people with wide feet. Several buyers are complaining that the shoe’s color bleeds onto the outsole, causing discoloration and ruining its look. Nearly all testers are disappointed with the shoe’s cushioning. The Phylon midsole feels very stiff, and they cannot feel the Zoom units. Some criticize that like the Air Jordan 6 Retro, the LeBron Soldier 10 is also poorly made. They’re claiming that the shoes easily rip and fall apart after just a few games. The shoe has disappointing traction according to most reviewers. Shifty guards who perform a lot of crossovers and quick changes in direction may find the Nike LeBron Soldier 10 restrictive and the traction lackluster. However, bigger guys who like to explode to the basket will love how supportive the shoes feel. LeBron James completed an epic comeback in the 2016 NBA Finals wearing the Nike Zoom LeBron Soldier 10. That’s reason enough for Cavs and LeBron fans to cop a pair of these championship basketball sneakers. The most surprising feature was the support since the shoe has no laces to speak of. For certain people I would recommend it. The Nike Zoom LeBron Soldier 10 is truly a big guy shoe – it’s like real man’s deal. As criticized as the Nike Zoom LeBron Soldier X is, overall, it isn’t a bad shoe — pretty good, actually, to this reviewer. Take command and showcase your explosiveness on the court with the Nike Zoom LeBron Soldier 10. Made for battle, the shoes feature a unique three-strap lockdown system that provides powerful support to keep you zoned in on your game. It also has the responsive Zoom Air cushioning that helps with explosive plays on the court. Cushion. The Nike Zoom LeBron Soldier 10 features a Phylon foam midsole with forefoot and heel Zoom Air units that provide responsive cushioning and maximum comfort. The Phylon midsole delivers a stable ride while the Zoom Air units cushion hard landings when jumping for a rebound and allow for explosive plays on the open court. Traction. The outsole features a multidirectional traction pattern that’s designed to shift naturally with your foot, providing instinctive responses that help with powerful transitions from the backcourt to the frontcourt. Length and Width. The Nike Zoom LeBron Soldier 10 runs true to size but has a very narrow opening. Wide-footers are advised to try it on in-store first. Lockdown. To keep you focused on your game, the LeBron Soldier 10 features a unique no-lace three-strap system that delivers full lockdown from heel to forefoot. The three-strap lockdown system securely locks the foot down and allows a customizable fit. The midfoot and forefoot straps offer strength and support while the lightweight ankle strap stretches to give a comfortable and adjustable fit without limiting ankle mobility. The shoe also includes a compression inner-sleeve that’s designed to provide snug-fitting support all game long. The Nike LeBron Soldier 10 has a tri-layer textile and foam upper that offers lightweight and breathable comfort to keep you fast and fresh as you attack the basket. The three-layer upper incorporates a stretch lining with perforated textile and foam to allow your foot to flex naturally. In high-wear areas, the materials are reinforced to enhance durability. Celebrating ten years of dominance, the Nike Zoom LeBron Soldier 10 pays homage to past Soldier models with detailed throwbacks in a fresh silhouette. Modern design elements merge with new technology to create a basketball sneaker that’s fit for a king. The Soldier 10’s distinct laceless high-top silhouette features logo icons and other design elements from previous Soldier shoes. Words and phrases that have constantly been seen on past models are incorporated along the outsole. Nike launched a wide variety of colorways for LeBron James’s trophy-winning basketball shoe. Menswear designer John Elliott was captivated with the LeBron Soldier 10 when he first saw it during the 2016 NBA Finals. “Seeing him in game three this summer, in that all-black Soldier X, that was like another moment where I don’t think I’ll ever be able to erase…there’s that kind of wow, like ‘Oh my God’ moment about it,” he went on to add. “You knew that something was about to go down. The all-black Soldier, it’s a beautiful and disruptive design. It was almost a little bit of foreshadowing, really, for what was about to happen for the rest of that series,” Elliott explains. The John Elliott X LeBron Soldier 10 features a mix of gray, white, and orange. A unique denim-like graphic around the ankle completes the silhouette. The ‘Four Wins’ Pack includes limited edition sneakers worn by LeBron James and Kyrie Irving during their epic championship run. Four two-shoe sets were made available at select retailers. A recurring theme in James’s signature line, the ‘Christ The King’ colorway pays tribute the James-sponsored New York City High School basketball squad. The Nike Zoom LeBron Soldier 10 ‘Christ The King’ features a combination of team red, off-white, and metallic gold. After completing a shocking comeback, Nike gave Cavs fans an early treat by releasing a limited number of LeBron James’s championship sneakers via NIKEiD. The Zoom LeBron Soldier 10 Championship iD features exclusive color options that match what James wore during the Finals. The Nike MLK Day collection includes a Triple Black version of the Nike Zoom LeBron Soldier 10. Nike athletes wore their all-black player exclusives during MLK Day to honor the efforts of Dr. King. This New York City exclusive colorway is limited to 100 pairs and was sold at select Nike locations across Manhattan. Each pair is individually numbered and features an all-black upper with bold anthracite “Nike NYC” branding on the ankle strap. A premium version of the LeBron Soldier 10, the ‘Pinnacle’ colorways features a white and black upper with tumbled leather straps. Other details include the area codes of Cleveland “216” and Akron “330” visible on the heel and side panels. The ‘Home’ colorway features a white upper while the ‘Away’ version is dressed in green. White, green, and gold accents complete the school-inspired theme. Specially made for the participants of the Nike Academy, the Zoom LeBron Soldier 10 ‘The Academy’ features a white upper with a multi-colored print around the toe box. The silhouette is finished off with a black Swoosh and an ice blue outsole. These all pink basketball shoes are specially crafted for the Kay Yow Cancer Fund. Featuring a ‘Think Pink’ theme, these LeBron sneakers are dressed in bright pink with white and black accents. Nike and LeBron James celebrated Veteran’s Day with a specially crafted Zoom LeBron Soldier 10. The new ‘White Camo’ colorway features a unique camouflage print with shades of white, blue, and silver. The pattern is meant to honor all the veterans who have fought and are still fighting for America’s freedom.